Driving Question: How do we prepare students for the challenges of the 21st century? The next generation will encounter a complex job market and unprecedented global issues. Rapidly changing technology will also continue to redefine what it means to be a 21st century worker. The agrarian style of education that has led the 20th century is no longer sufficient to prepare students for these challenges, as complexities replace rote work. Research within the fields of business, science, technology, and education have identified the need to prepare students with 21st century skills (critical thinking, creativity, communication, and collaboration) and literacies (entrepreneurship, health, civic, financial, and technological). Eduthink21 has developed a project based learning model, based upon a decade of research within an independent lab school. Our goal is to guide educators with the transition from theory to practice, making 21st century learning a reality within classrooms. The model focuses on the hands, hearts, and minds of students, through a whole-brain and whole-child approach. Deep knowledge and inquiry are fostered through authentic learning experiences, driven by student interests and community partnerships. It also observes the fundamental 21st century skills and literacies. Our blog will take you on an in-depth exploration of the learning model. A webinar series will provide an overview and comprehensive training in project-based learning. Classrooms in-action and sample projects will highlight real-world examples. 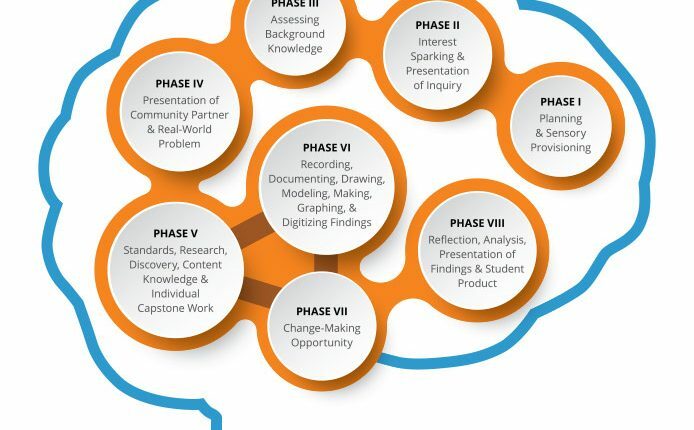 Educators will have the option of becoming certified in the project based learning model through the webinar series, by completing a self-study and portfolio submission. Join us by following our blog, as we explore the aspects of high-quality project based learning through Eduthink21’s model. Also view our school-wide and district training options, listed on our website. Take the first step to prepare your students for future college and career readiness. It is time for teachers and students to apply their passions to teaching and learning!